Bill Ackman launched his latest attack against Herbalife on Friday, releasing a highly critical video about the company at an event in New York. The billionaire hedge fund manager, who stands to gain $1 billion if Herbalife's (HLF) stock price collapses, unveiled the 13-minute video featuring interviews with former distributors who say they were victimized by the company. Ackman, who spoke briefly at Friday's event, said his Pershing Square hedge fund is not compensating the former distributors beyond paying their travel costs, hotel bills and providing a small per diem while they are in New York. However, he said the fund has indemnified them against any potential litigation by Herbalife. The video marks the latest phase in a more than year-old campaign Ackman has waged against Herbalife, which he believes is a pyramid scheme. Herbalife sells nutritional supplements and weight loss products via a global network of independent distributors. Ackman argues that Herbalife is a pyramid scheme because it makes more money by recruiting new distributors than it does selling products to consumers. He says the company deliberately targets Latinos and other vulnerable immigrant groups. 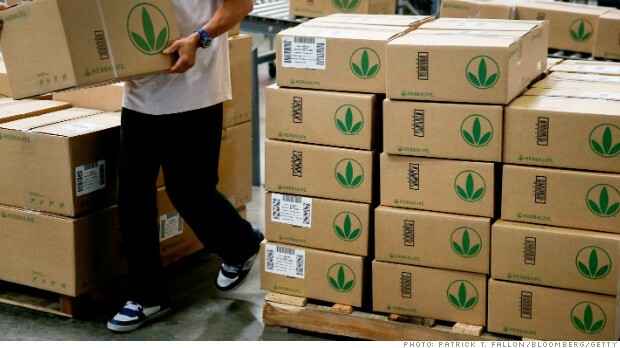 Herbalife disclosed in March that it is being investigated by the Federal Trade Commission. The company has said that it is cooperating with the inquiry and hopes that it will clear up "misinformation" in the market. Federal law enforcement officials have confirmed to CNN that the FBI and U.S. Justice Department are also looking into Herbalife, though the company has not commented on any criminal investigation. In the film, the former distributors describe how they lost tens of thousands of dollars after being led to believe they would be able to earn up to $10,000 a month selling Herbalife products from home. The former members of Herbalife's vast direct sales network all said they were encouraged to bend the truth when presenting the "business opportunity" to potential new members of the system. "It's really not about selling Herbalife," one says. "It's really about getting people's money by bringing them into the business." Herbalife dismissed the film before it came out. The company released a statement Thursday saying the video was "nothing more than propaganda." "The company believes this is yet another tactic in Mr. Ackman's calculated, coordinated and well-funded effort to destroy a 34-year old company and support his $1 billion bet against Herbalife," the statement reads. Herbalife also seized on the fact that veteran journalist Connie Chung had backed out of the event at the last minute. Chung was scheduled to moderate a panel discussion with some of the former distributors Friday, but she apparently had some reservations. "I intended to fully vet every aspect of this complicated story but concluded I needed a team of researchers, which I did not have at my disposal," Chung is quoted as saying in a statement released by Pershing. "There were too many levels and sides to the story." Herbalife said Chung's decision is a sign that the film is "misleading propaganda designed to help achieve [Ackman's] ultimate goal of enriching himself by driving down Herbalife's stock." For his part, Ackman pointed to Herbalife's recent decision to buy back more than $1 billion worth of its own stock, a tactic he says is designed to prop-up the company's share price and limit the amount of money that can be recovered by potential victims. "Most companies try to buy back stock at lowest possible price," he said. "It appears to us that Herbalife is buying back stock at the highest possible price in order to prop up the stock."